Isn’t it so tempting then to think “Well, if you’re happy not talking to me, I shall make the most of a quiet journey home and catch up on Facebook!”? Of course that’s not us – no matter how tempting. We appreciate now more than ever the importance of communication with our children. So, what do we do to get a response from a child that looks at you as if you’ve asked them to explain Einstein’s theory of relativity? Here are five no fail tips to tease out more than three words! Open-ended questions are questions that you can ask to receive anything but a “Yes” or “No” answer. Try to avoid questions that start “How was…?” Kids are clever little munchkins and they’ll sneak in a “Good” or “Ok” before you can tie their shoe-lace! Even if it’s just momentarily to ask the first question, bend down so that they can see you closely. Look and smile into their eyes. It’s been a long day for little ones and they’ll have missed your face and even your smell. Obviously if you have older children, you bending down will only make them assume you have a bad back, so always act appropriately to avoid embarrassing your nine year old. Talk about your children – not their friends. 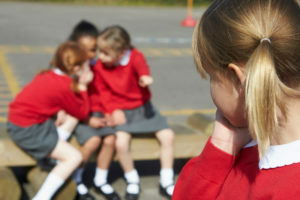 This may seem an odd one but children fall in and out of friendship groups continuously. A BF one day can be Veruca Salt or Horrid Henry the next. The mention of their very name could cause your child’s mouths to clamp tighter than a vice and their eyes to well up like Old Faithful. Often, to evoke a thought searching yet simple response from your child is to use emotion words. Children love talking about themselves, especially any achievements that they’ve accomplished. So how about changing the subject (excuse the pun) and trying “What would you like to do after school today?” Be careful here! It may be wise to give two options before you end up at Lego Land! If all fails and your child remains tight-lipped all the way home, why don’t you try talking about your day? Yes, I know it was crap but a little white lie here and there may just help to open up the airwaves! No! Rein your imagination in! I can honestly guarantee more than a shrug here. In fact I can guarantee at least “A real hedgehog?” and off you go. So, we all know how to talk to our children. They are our children after all and no one knows them as well as we do. Sometimes, however, your child maybe particularly quiet when they normally talk for England. This can be a concern but there are things that you can do and listen out for. Your child may have a favourite cuddly toy that they talk to. Keep an ear out at these non-talkative times as you may just overhear a conversation that gives you a clue as to why they are being quiet. 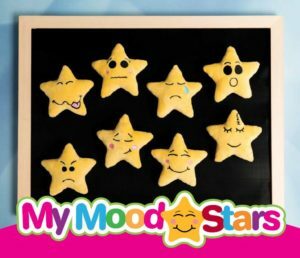 My Mood Stars are a highly effective toy for encouraging children to talk about how they are feeling as each of the eight Mood Stars has its own emotion and character. My Mood Stars are soft and sensory and can be carried around like other soft toys. When children play with My Mood Stars, 90 percent of the time, they will strike up a conversation with one or more of them. This is hugely helpful when your child won’t talk to you and you’ve run out of questions! Another lovely aspect of My Mood Stars is that the back of them stick to Velcro material. How many of you have children with Velcro on their coats? A Mood Star of their choice can accompany your child to school or anywhere else that they may want to take one simply attached to the Velcro on their coat’s fastener! Now if that isn’t a conversation starter!! And the link to My Mood Stars here where you can purchase the set of My Mood Stars and also the My Mood Stars book that uses sensitive prompts to encourage discussion about how your child is feeling. The My Mood Star book has a space on each page for drawings or writing about, well, anything that they want!